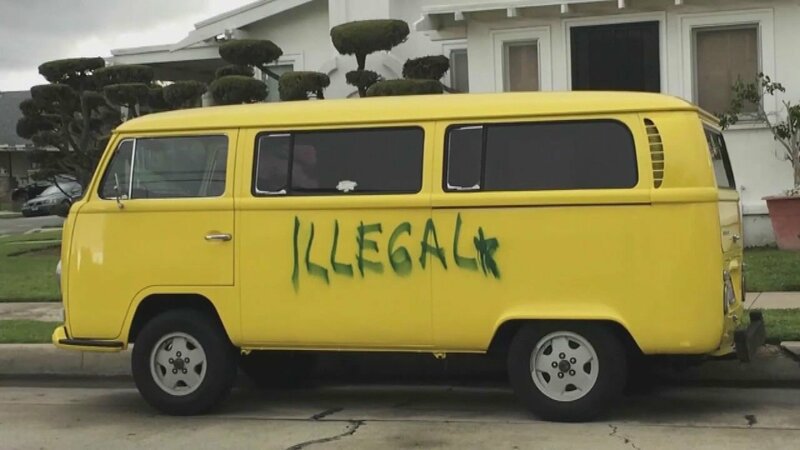 LONG ISLAND, Calif. (WLS) -- Vandals spray painted the word "illegal" on a man's van in Long Beach, Calif., and the man said he's a U.S. citizen. Joe Solis said he first thought his van was parked illegally. Then he realized he was suddenly dealing with a possible hate crime. Solis said he blamed the current climate in politics for the vandalism. He said many neighbors have been leaving encouraging notes on his door. "All my neighbors have been coming through the neighbors I used to wave to, have been coming over to shake my hand. I'm getting notes on my door. Someone drives up to me and gives me a note that says 'Hey, we love you in our neighborhood and this shouldn't happen," he said. Another car in the neighborhood and a banner at a church were also hit. KCBS contributed to this report.